This little reduction woodcut is a unique impression. 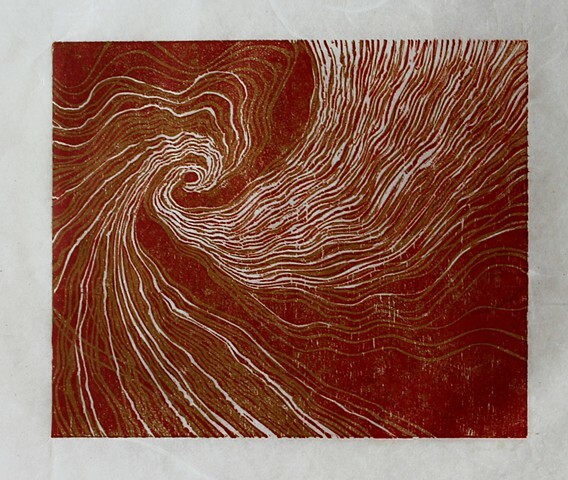 The first layer was printed in ochre ink, then the plate was altered and the initial print was overprinted in red. There are other prints of this woodcut available in other colors, but this particular combination was not repeated. The print was made on Japanese Unruyu paper--a bright white paper that is flecked with many long fiber inclusions in a characteristically cloud-like formation. The paper is quite a bit larger than the actual print size.